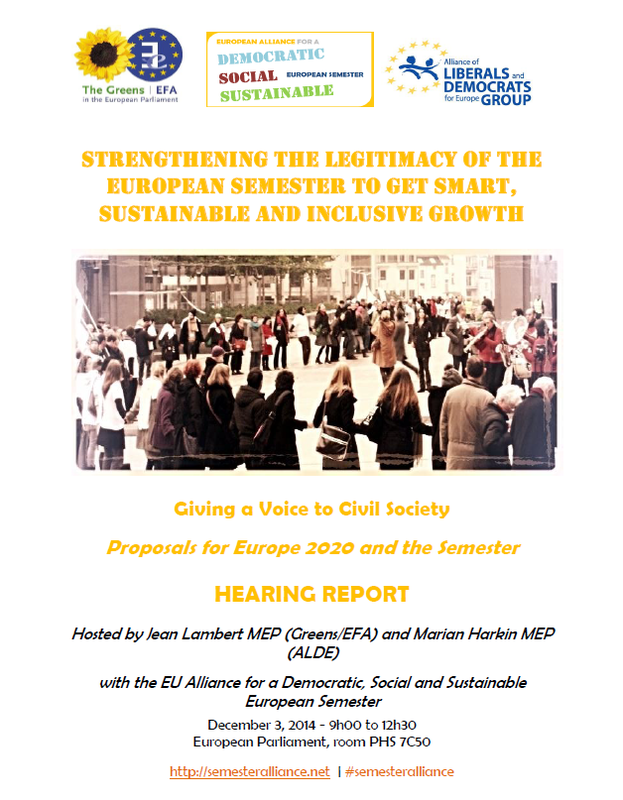 On 03/12/2014, the EU Semester Alliance held a well-attended hearing in the European Parliament, Giving a Voice to Civil Society Proposals for Europe 2020, hosted by Hon. Jean Lambert MEP (Greens / EFA) and Hon. Marian Harkin MEP (ALDE). A short report of the hearing, with the Semester Alliance key messages and links to the presentations and photos of the event, is now available. It was the second such hearing organized by the Alliance in 2014, presenting to decision-makers and stakeholders the Alliance’s assessment of and proposals for a democratic, social and sustainable way forward for the Europe 2020 Strategy and the European Semester in 2015. See also the hearing’s related news (05/12/2014) Giving a Voice to Civil Society Proposals for Europe 2020: Semester Alliance hearing in the EP gets wide support.